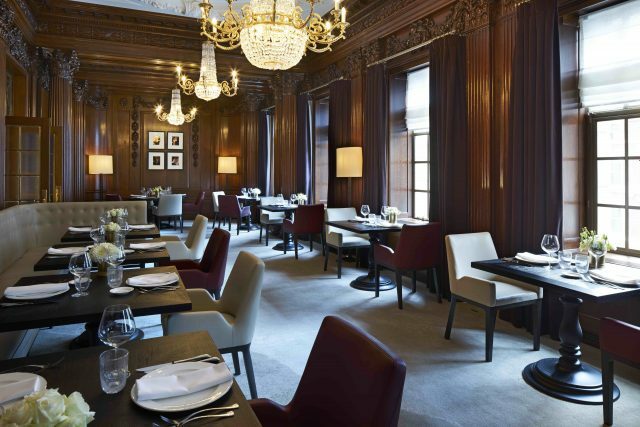 db’s Lucy Shaw heads to the new private members’ club at The Four Seasons for Château Latour poached foie gras and seared scallops with smoked mash. 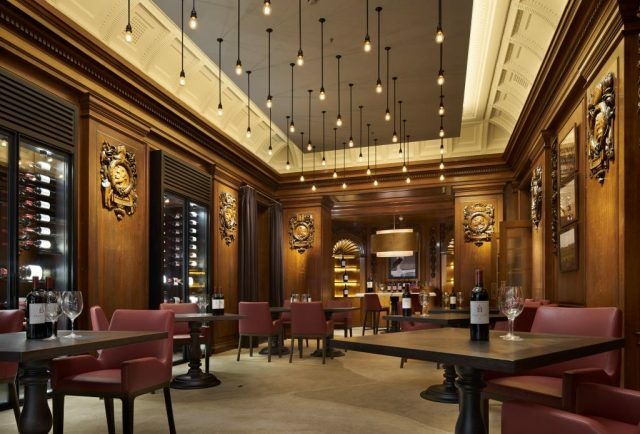 The concept: Watch out 67 Pall Mall, competition has arrived in the form of shiny new private members’ club Ten Trinity Square at The Four Seasons in Tower Hill, which boasts, among other delights, a Château Latour ‘discovery room’. Opening its doors last autumn, the club has already recruited nearly 500 members, many of whom are City boys who live and work in the captial’s financial heart. At £3,000 a year, membership isn’t cheap, but recruits benefit from perks like being able to use the Four Seasons gym, spa and laundry service. The décor: The club’s lavish interiors are the work of Bruno Moinard, who looked after the Château Latour redesign in 2014. There’s enough wood in here to build an ark. Hand-carved walnut panelling abounds and the club’s maze of rooms are prettified by ornate chandeliers, Corinthian columns, antique clocks, marble fireplaces, decorative scallop shell shaped detailing and plush velvet upholstered sofas. I half expect to walk past Ron Burgundy relaxing in an armchair with a leather-bound book. Given a grand tour, I follow a ribbon of red that weaves its way down the cream carpet in the hallway; a detail Moinard added to represent the ebb and flow of the Gironde River. 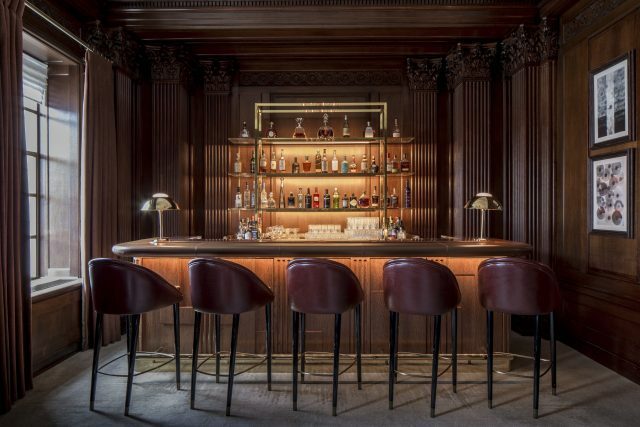 With its library, billiard room and cigar lounge, a night at The Club feels distinctly like you’re in a game of Cluedo – just call me Miss Scarlet. The food: Members are in for a treat as the food offering is looked after by multi Michelin-starred chef Anne-Sophie Pic, who runs La Dame de Pic (meaning the Queen of Spades in French) downstairs. With six Michelin stars to her name, including three at her flagship Maison Pic in the Rhône, Pic is one of the most highly decorated chefs in France. Hailing from a family of culinary whizzes, Pic is the third generation of her clan to have earned three stars, and did so with no formal training. While her menu at La Dame de Pic boasts Asian influences, she keeps things classic at The Club. Among the dishes on offer is a starter of creamy foie gras poached in Château Latour with plum chutney and lovage for those seeking to begin the evening on a decadent note; rabbit terrine with Chartreuse; spelt risotto with artichoke; and roast Scottish lobster with chestnut taglioni. For those seeking solace in food after a hard day at the office, a separate members’ dining menu offers comfort food classics like mac ‘n’ cheese, fish ‘n’ chips and cottage pie alongside swankier dishes like crayfish bisque with dried apricots. 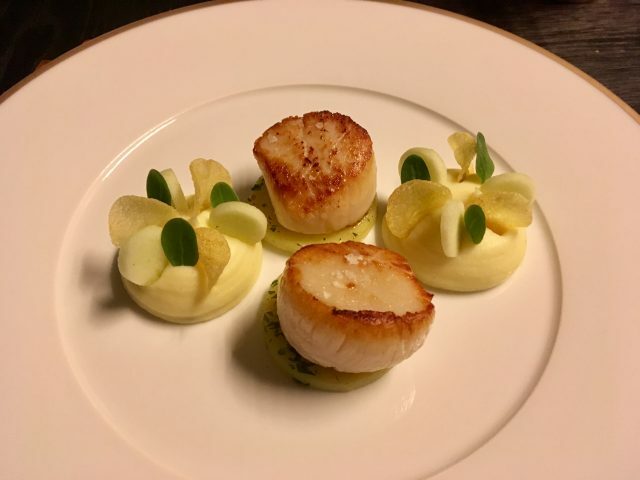 Signature dishes: My duo of seared scallops with smoked mash, apple and lovage was a clever contemporary twist on a classic French dish. The Isle of Skye scallops were sweet, fat, perfectly caramelised on top and silky in the middle, while the smoke-laced mash was impossibly creamy and discs of apple added welcome freshness. Pic’s skill also comes into play during dessert. My tarte tatin, with its feather-light crispy pastry, unctuous caramelised apples and swirls of rich caramel sauce, is a delight. The drinks: The Club has plucked German head sommelier Jan Konetzki from Gordon Ramsay Royal Hospital Road to head up its wine offering. Having collaborated with Bordeaux first growth Château Latour on the project, The Club’s wine list features six pages dedicated to Latour dating back to the 1930s. In the Latour Discovery Room you’ll find double magnums, Jeroboams and imperials of the elixir winking at you from behind glass. The list showcases wines from esteemed Bordeaux and Burgundy estates alongside lesser-known growers that punch above their weight. You’ll also find several rare white Rhônes from Château Grillet, which Konetzki calls “liquid history”, Grands Echezeaux et al from Domaine d’Eugenie, and enticing instalments of the Clos du Tart, all overseen by Artemis Domaines. In terms of Champagnes, Krug, Salon and Selosse are all present and correct, as are Konetzki’s favourite fizzes: Marguet Père & Fils Elements Grand Cru Extra Brut NV, and Clos de Goisses from Philipponnat. The house Champagne, Delamotte, costs a reasonable £12.50 a glass. The cocktails in the bar are rather good too. My refreshing Japanese Garden blended Kinobi gin, yuzu and cucumber, and was an ideal apéritif. Who to know: The Club’s affable and entertaining general manager, Nigel Stowe, who arrived at the Four Seasons by way of The Ivy and The Arts Club. He’s a man with impeccable manners and many stories to tell. Last word: The Club is only open to members, so it’s reach will always be niche. For wealthy wine lovers keen to unwind in the capital, it offers a sumptuous and sophisticated oasis of calm far from the madding crowds. ‘Michelin-starred chef Anne-Sophie Pic, who runs La Dame de Pic (meaning the Queen of Spades in French) downstairs.